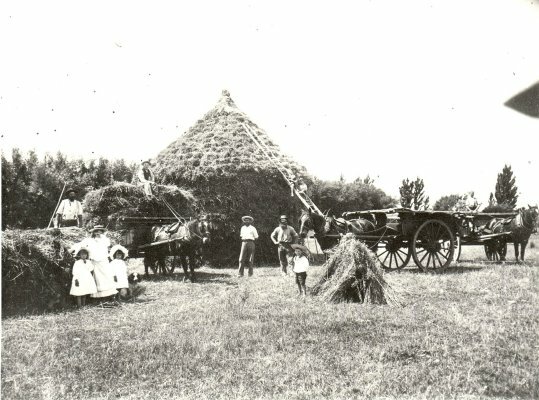 Description A black and white photograph showing men stackers, a women and some children with horse drawn vehicles in an oat paddock with a large oat stack. Information as typed by Norm Brayshaw: "Stacking on a farm on the Wairau Plain. Oats for chaff to feed the horse teams, possibly in the Rapaura area." Copied by Norm Brayshaw in 1964 from an Irvin of Tua Marina photograph held by [not stated]. Includes a negative. A scan of this photograph is to be used in the Changing European History Gallery 2 display in commemoration of the Marlborough Provincial 150th anniversary on 1 November 2009. There is another photograph in the packet which was taken at the same time and is a closer view of the oat stack (see catalogue record 0000.900.0769).